A large portion of Interstate 95 north of Brunswick, Georgia had to be shut down after a southbound FedEx truck crashed through a dividing guardrail and hit an SUV, according to Jacksonville.com. The FedEx big rig was reportedly pulling two trailers when the second trailer overturned as the big rig approached the end of I-95 on-ramp at Spur 25. The truck slammed the dividing guardrail ultimately hitting an SUV. Glynn County Police confirmed that there was a fatality in this accident, according to wsav.com. Deepest sympathies go out to the friends and family of the victim. Losing someone you care about is never easy, but the pain of losing someone in an unexpected accident is made that much worse. When someone dies as a result of the carelessness of another party, the surviving loved ones may have grounds to pursue a wrongful death claim in civil court. You may have mixed emotions about filing a lawsuit and may feel overwhelmed with the prospect of taking another individual, or company, to court. This is perfectly understandable. That is why it makes sense to retain the services of an experienced Georgia wrongful death lawyer to advocate for you and your deceased loved one. If the decedent is not survived by a spouse, kids, or living parent, then to the administrator of the decedent’s estate. 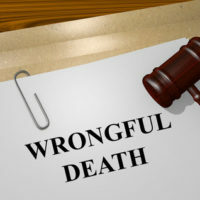 As you can see, this means relatives like an uncle, aunt or grandparent have no right to pursue a wrongful death claim. Furthermore, if you were engaged to the victim, but not legally married, you would not meet the definition of spouse and cannot bring a wrongful death lawsuit on behalf of your deceased fiancé. This is why it is so important to speak to an experienced wrongful death attorney to discuss what legal options are available. Who is entitled to receive the proceeds of a wrongful death suit, if a damages award is entered in the plaintiff’s favor. The legal team at Gillette Law in Brunswick understand that there is not enough money in the world to properly compensate you for the sudden loss of a loved one. However, an award of monetary damages is the basis for our civil justice system and recovering a large damages award may send a signal to others to exercise more caution and vigilance while on the road. This is why you should contact our firm to discuss the best course of action. We will be with you every step of the way.